Are you looking for a way to stay happy and healthy this winter? Wintertime takes a mental and physical toll. As a whole, humans in northern climes tend to be less active and more stressed out during the winter months. This leads to a decline in mental and physical health. Luckily for gardeners, there is an answer. Extending your growing season with a simple hoop house provides countless health benefits to help you get through this winter. Farm fresh produce offers gardeners more control over their food than anything purchased at the grocery store. As the gardener, you get to choose whether or not you use chemicals, grow nutrient dense heirloom varieties or GMO varieties, and how you process and store your produce. Organic practices prevent harmful pesticides, herbicides, and fertilizers from invading your food. No need to worry about the effects of the latest super spray unless you put it on your garden yourself. Certain varieties of vegetables contain more nutrients than others. Heirloom varieties are usually the healthiest choice, although this is not always the case. A little research goes a long way. 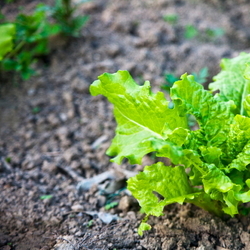 Certain types of lettuce, for instance, are more nutrient dense than others. Leaf lettuce contains more than three times the number of nutrients as iceberg lettuce. Greens from the grocery store often contain bacteria like E-Coli. Washing your hands prior to harvesting and preventing uncomposted feces from livestock and wildlife from coming into contact with your garden helps limit the risks. Plus, your vegetables are fresh. They did not travel long distances to get to your home, encountering all sorts of unpleasant things along the way. Hoop houses allow you to extend your growing season. This means that you get healthier produce later into the year, maximizing the health benefits of your garden. If you are reading this article, chances are you enjoy gardening. I don't need to tell you how rewarding it is to feel the sun on your face and the soil on your hands, or the satisfaction of picking a perfect tomato grown from seed. It turns out these pleasant feelings are also good for your health. Gardening is a physical activity. It burns calories and produces endorphins, which make you happier and healthier. Burning calories helps you maintain a healthy weight, which in turn decreases your risks of obesity and disease. According to the CDC, just 2.5 hours of gardening a week reduces the risks of high blood pressure, obesity, type 2 diabetes, heart disease, depression, stroke, osteoporosis, colon cancer, and even premature death. All things most of us are eager to avoid. Surprisingly, gardening is a pain management tool used by physical therapists. It helps reduce physical pain and when done carefully, assists in the rehabilitation process. For patients dealing with chronic conditions, it is an invaluable tool for mental and physical well-being. Even a stroll through a garden is helpful. Gardening helps manage stress. Major life events and work related stress all get relieved in the garden. From Alzheimer's symptoms to depression, gardening is a proven health management strategy. There is preliminary evidence suggesting it even helps lower the risk of dementia. If you don't feel like working in your garden, take a walk through it. The mental processes engaged by nature actually replenish our taxed and overworked minds. This is especially important if you work a desk job or spend a lot of time on the computer. Getting outdoors in your garden relaxes and revitalizes your mental energy reserves. Summertime is often when we are happiest, whether we garden or not. The real trouble starts in the winter. Trapped indoors and surrounded by holidays, the stress compounds. Extending your growing season is a great way to manage this stress and give you and your loved ones a more enjoyable season. 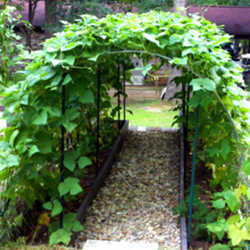 Hoop houses allow you to enjoy the benefits of the garden at a time when everything normally lies dormant. Winter greens do more than grace your table. They bring you a little peace of mind, too. Forcing ourselves outside in the cold is difficult. The best intentions often fall as short as the days. For many, it is dark outside by the time they get home from work and outdoor activities are limited. Hoop houses cannot impact the daylight, but they can provide you with warm, outdoor fun on the weekends, and even a quick trip to the garden to harvest some greens for dinner by flashlight is rewarding. 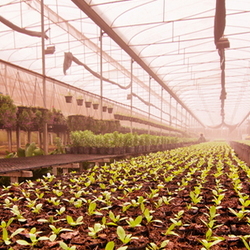 There is less to do in the hoop house in the winter than during the growing season. Plant growth, weeds included, slows. I find I spend a lot of time sitting quietly as I tend to my winter garden, appreciating the exaggerated warmth of the sunshine and the smell of the soil, not to mention the lack of irritating insects. It is not too late to get a hoop house up and growing. Kits and garden supplies are on sale this time of year, giving you a little extra pocket cash to get your seedlings off on the right foot. Improve your health this winter by doing what you love.